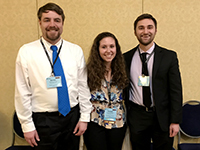 PYIII student pharmacist Jacquelyn Madler won the 2019 Know Pain, Know Gain Patient Counseling Competition at the Pennsylvania Pharmacists Association (PPA) Midyear Conference held January 24-27 in Gettysburg. Jacquelyn represented the Duquesne University School of Pharmacy in the competition against nine student pharmacists from pharmacy schools throughout the state and advanced to the Top 3 after advancing through a rapid-fire question round covering a wide array of topics, inlcuding palliative care, acute care, methadone, geriatric issues, LTC issues, chronic pain, outpatient assessment, non-opioid based drugs, suboxone, abuse and overdose, laws and regulations, adverse events, and advice for patient counseling. The final round includes a mock patient counseling session developed by the judges. The finalists interacted with a mock patient suffering from chronic pain and personality issues for up to seven minutes, testing the student pharmacists' pharmacy knowledge as well as communication skills and bedside manner. "(The patient counseling competitiong) was a wonderful experience to be part of," Madler said. "I got the chance to sit down and speak to the judges on how they learn to cope with chronic pain patients. It was nice to hear that sometimes patients just need a fellow friend or non-pharmacological therapy. I learned a great deal from the competition, and I highly recommend others to compete in the future." A Duquesne University student pharmacist last won the competition in 2016.